On March 21, 2004, we left California for an Arizona vacation. 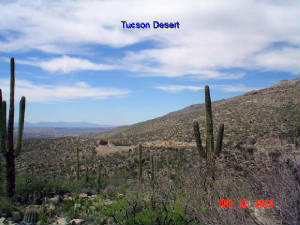 The photos here are a representation of the Tucson and Prescott areas. We hope you enjoy them as much as we do! Arizona is the land of the saguaro cactus! You see them everywhere you drive, except in the higher elevations of the local Santa Catalina Mountains. Many of them are hundreds of years old. Our trip began in Tucson where we visited cherished, long-time friends; the Saguaro National Park; the Tucson Desert Museum; and the local mountains. The Arizona desert is different than the California desert. Aside from the saguaro cacti, there is a lot more underbrush of succulents that add to the beauty of the terrain. We were in Tucson from Sunday evening until Thursday morning when we broke camp and drove north to Prescott. Point of Rocks Campground is where we spent Thursday and Friday nights. 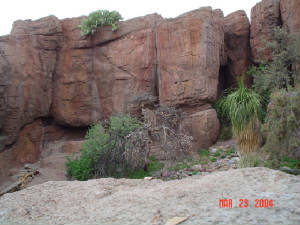 The campground is literally situated in the midst of large rocks with clearings for camp sites. Even our cat, Tigger, enjoyed being out on a leash wearing a cat halter: there were trees and rocks to sniff, and birds and bugs to watch! On Saturday morning, we broke camp in Point of Rocks and headed back to California. We now both have "Arizona Fever!" Monday on the way up to the mountains, we stopped at a lovely vista site with walkways going down to the mountain stream. It was a great place to take photos! 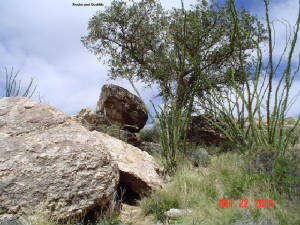 The photo to the right shows ocotillo growing up next to the rocks. Ocotillo grow in the Sonoran and Chihuahuan deserts of southeast California to west Texas and south into Mexico. Despite their spiny appearance, ocotillo are not cacti. They are pollinated primarily by bees but also support hummingbirds. They produce red flowers, 1/2 to 1" long in 10" clusters. Even with little rainfall, they will bloom annually. The photo to the left was taken from a vista stop on the way back down the mountain. Because of road construction and repair, we were unable to drive to Mount Lemmon at the top of the mountain. The views, however, were still very impressive! Being there again brought back memories of when I lived in Tucson and why I enjoyed the mountain drive so much! There was still visible evidence of the recent fires that burned many acres in the mountains. Arizona faces the same problems as California with bark beetle infestation and drought. Tuesday we went to the Tucson Desert Museum. There are many cactus gardens and pathways winding throughout the museum, and all the plants and animals that live in the desert can be seen there, including mountain lions and big horn sheep. 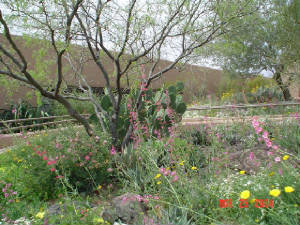 Just outside the entrance of the Tucson Desert Museum were these beautiful desert flowers in bloom (see photo at right). Never let it be said that I missed an opportunity to photograph flowers! Admittedly, it is one of my weaknesses, photographically speaking! 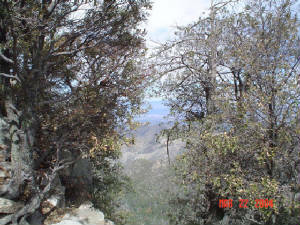 The mountain lion in the photo to the left is well-camouflaged, sitting on a large branch in front of the cliff. He sat there for a long time as if posing for people taking pictures of him (actually, I think he was eyeing someone's dog)! You can see him much better by clicking on the photo to see an enlargement of the picture. 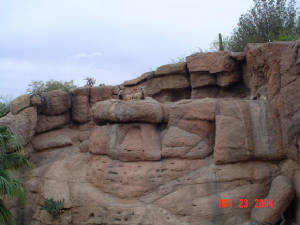 In the photo to the right, you can see two big horn sheep resting on top of large rocks at the Desert Museum. As with the mountain lion, they are very well-camouflaged! In a zoo setting, you know they are there if you look hard enough; however, but when you're hiking around in the desert, they are usually very difficult to see. Big horn sheep also reside in the Anza-Borrego Desert in Southern California. 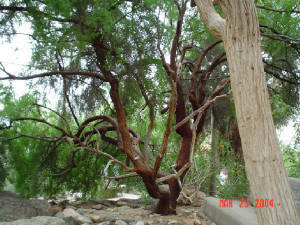 In the bird sanctuary portion of the Tucson Desert Museum, this beautiful tree was too picturesque to ignore!